WE WERE THERE when the first privately owned TV channels were signing on across Europe, Latin America and Asia, expanding the media landscape from a few government-controlled channels in many countries to dozens, and then hundreds, of new viewing choices. We opened a pipeline of fact-based programming to the eyes of an information-hungry world. Trade magazines ran stories about our 350-hour distribution catalog of short mini-documentaries, with headlines like "PLANET Has 'em Buy the Shorts." Soon to follow were original series like "The Urban Peasant," the cooking show with host James Barber, co-developed with Canada's CBC. As that show grew to 650 episodes, PLANET distributed it into over 80 countries worldwide, via THE DISCOVERY CHANNEL and many others. The PLANET program catalog eventually expanded to include more than 3,000 program offerings. AT THE DAWN of a new decade, PLANET president Jim Hayden was tapped to create, staff and manage a new program unit in affiliation with Turner Broadcasting's SuperStaion TBS. "Earthbeat" premiered as a weekly half-hour following "National Geographic Explorer," bringing viewers a new kind of television about the environment. As we said the night we signed on, it was time to "stop wringing our hands and do something more constructive with them" concerning the well-being of our planet. "Earthbeat" represented a fresh approach--a how-to for personal involvement in solving the world's most pressing environmental dilemmas. 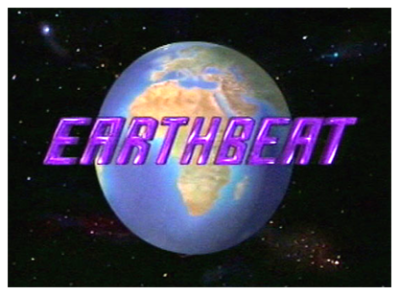 "Earthbeat" was launched as a non-profit and financed with charitable contributions but proved so appealing as a concept that Ted Turner himself agreed to pump up the funding and take the show in-house. The re-tooled, fully financed version continued as "Network Earth," enjoying five more highly successful years on air every Sunday night. IT BEGAN WITH A QUESTION from a DIRECTV program buyer: "If PLANET has all these programs, why doesn't it have a channel?" The rest, as they say, is history. 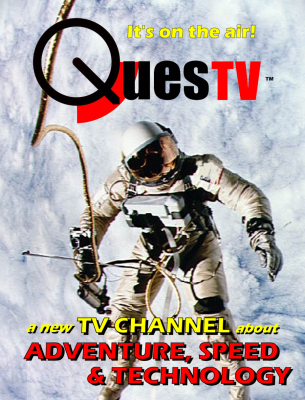 QUESTV became a full-time 24/7 documentary channel on DIRECTV in 1998 when they were launching their new direct-to-home (DTH) satellite service in Japan. Considering DIRECTV was the most successful DTH content provider in the world, we were thrilled to be in business with them! Shortly after, QUESTV also gained carriage on the powerful pan-European ASTRA satellite system, and opened an office in London. The content theme was "Adventure and Toys for Grown-up Boys," appealing to a male demographic interested in cars, planes, boats, technology and outdoor adventure. QUESTV proved popular enough to become part of DIRECTVs five-channel "American Pack," a basic tier provided to all subscribers. But some two years later, DIRECTV decided to close down its service in Japan. Subsequent offers for carriage from other systems in Japan were less lucrative and it was finally decided instead to sell the QUESTV asset to a large European media conglomerate. PLANET'S DIVERSE ARCHIVE of quality factual content once again caught industry attention at the turn of the century, when fast Internet connectivity began firing the imaginations of media pioneers. Server tech developer SEACHANGE INTERNATIONAL was seeking ways to demonstrate their newest video-on-demand (VOD) systems, and decided to make a seed-equity investment in PLANET, to fund a spin-off we dubbed NICHECAST MEDIA. 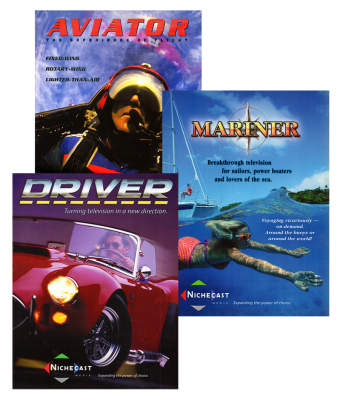 Foreseeing a decline in special-interest print magazines, NICHECAST created pools of interactive video content appealing to aviation buffs, boating enthusiasts, car-lovers and others who might enjoy exploring their passions on TV and computer screens, in Dolby surround sound, instead of just in words and pictures on a page. There was no YouTube yet. There were no iPhones. The likes of Netflix wouldn't begin streaming for more than a decade. But thanks in part to NICHECAST, those SEACHANGE servers were already demonstrating what was to come. While successful as a ground-breaker in the new media era, NICHECAST suffered a critical limitation on it's own commercial growth: It was about a decade ahead of its time. ANOTHER "FIRST" FROM PLANET started what was to become something of a cable TV fad--the Auction Genre. 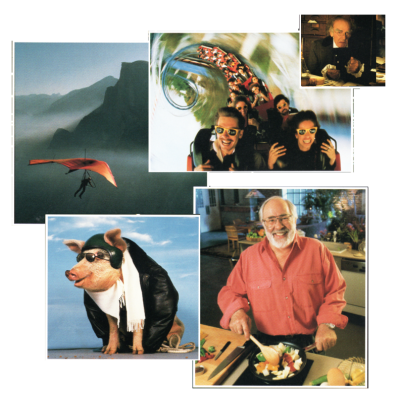 Created and produced for SCRIPPS NETWORKS under their Fine Living brand, "Auction Adventure" grew into a 26 episode docu-reality series in which presenter Michael Eldridge actually decorated and furnished his real-life Brooklyn apartment by haunting famous auction houses. The challenge was to see if Michael could walk in off the street to such hallowed institutions as Sotheby's, Christie's or Guernsey's and, on a budget of $500 per auction, walk out with a one-of-a-kind treasure. It wasn't easy. 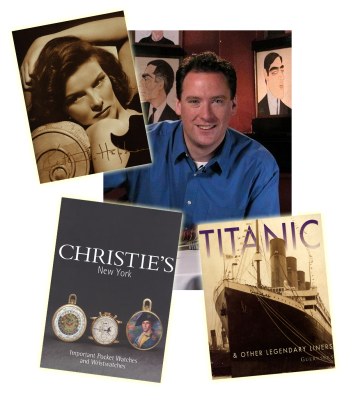 In fact, he came up empty handed at his first auction, of memorabilia from the Katherine Hepburn estate. It was still plenty entertaining, like when Wayne Newton bought the canoe from "On Golden Pond," but poor Michael was simply outbid on everything. Soon enough though, he got the hang of the auction thing, and we learned the ins-and-outs along with him. "Auction Adventure" still lives, now streaming on-demand via Amazon. AN IMPORTANT PART OF PLANET'S MISSION has always been about identifying and promoting promising new content creators. 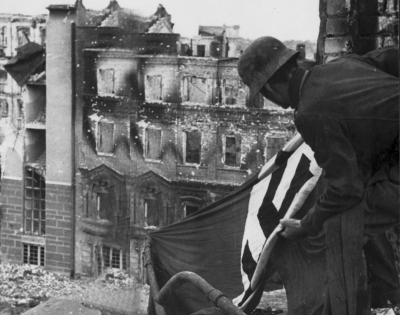 Among recent examples, a concept that came to us as a video clip re-framing the history of the Battle of Stalingrad, and an indie-doc about medical breathroughs in treating female menopause. PLANET worked intensively in development with the creators of "Deadliest Battle" and secured a prime-time nationwide slot for the resulting hour-long program on PBS's "Secrets of the Dead" strand. Meanwhile, "Hot Flash Havoc" came to our attention as a feature documentary on the festival circuit. PLANET brought the original movie to PBS and negotiated a deal to remake a TV version which became the anchor program for a national PBS Pledge drive. The deal included the customary Pledge incentive premiums--related DVDs and books--purchased by PBS stations and given to donors, generating additional revenue for the film's creators while drawing added financial support for PBS--"From viewers like you!" PLANET PICTURES always has its eyes and ears open for the next creative concept, the next content breakthrough. For promising producers and content owners, we offer development support, access to an audience--and income. For media outlets, we offer a source of fresh ideas and talent, an added means of expanding content options. Let's COMMUNICATE TODAY!